Children are our little educators. They mirror us. They laugh when we smile, cry when we are sad, say the truth when we lie. And there is no escape from this mirror. There is another mirror called nature that tutors us in its own way and I am an eager student of both. My garden is my classroom. The sun is our class teacher. Here, spotted doves come in and leave when they want to. Fledglings learn to fly. Koels and Barbets tweet their songs in delight. And then there are a pair of talkative pirnia, whiskered Bulbuls and swift Sunbirds. Swarms of buzzing colorful bees and butterflies and endless possibilities. It is not that they are always happy. There are fallen nests, lost eggs, chasing Shikras, one legged birds and praying mantis eating beautiful butterflies. This classroom has answers to the questions of life basking in the sun and lazing around. The garden nurtured a mother cat and her kitten sometime back. The kitten lived with us for a year and in that one year she lived a full life. She crossed into adulthood, befriended tomcats and became a mother. A fierce mother at it, protective of her little one, whom we called fruity. Fruity died in three months for unknown reasons. For the first time we saw a cat desolate, miserable and mourning her loss. The last time we saw her was on a rainy day in June. She may have passed on, but the hope that she is alive somewhere makes us happy. The lessons we learnt from the young cat is immeasurable. Before the cats came along, we had two dogs. The first one was a stray breed. He was majestic, sharp and was aptly called Sheru, the lion. Of all things, he knew how to play with my two year old son. My son would gather pebbles and drop one by one near him, calling each one a biscuit, cake, rice, chocolate etc. Sheru would religiously sniff each pebble, lick it and look at him. My son would say, good boy and drop another pebble. The game would go on till I got bored. You see, none of these afore-mentioned birds, butterflies, bees, cats or dogs sat like me and pondered about the purpose of life. They seemed content with what they have and don’t have. They were happy doing things they wanted to do. They were learning their lessons along the way and did not record it for future references. I strolled, paused, stared and wondered until I saw the next house kid play with a Rubik’s cube in his front yard. He was not bothered about the world around him. He was exploring possibilities in his toy. His face reflected contentment. He enjoyed his game. At that moment it dawned on me that it is because we seek the fruits of our actions we are not content with our toy called life. We contemplate its purpose, seek deep meanings and feel defeated. In the little hands of the toddler was the philosophy of life. Turning, trying to gather its colors together. A wise lesson was learnt that day. 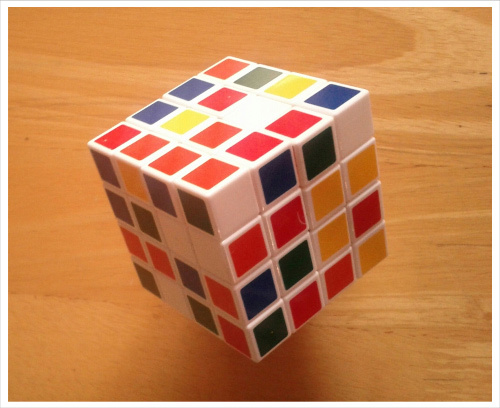 Though I am colorful~ my life is a puzzle~ an unsolved cube quipped.